Up early as we had a tour booked today. It was brisk and chilly at 8am, and we got to watch the sun rise over the horizon, bathing the city and river in golden light. We did not watch us arrive as it took place at 3am; however the captain had to make some tricky manoeuvres during the night. Apparently the lock is 31 metres wide and the ship is 28 metres, a tight squeeze! After breakfast we debarked Azamara Quest and joined our bus for a short ride to the Maria Luisa Park passing the pavilions for many countries that were built for the 1929 Seville expo. 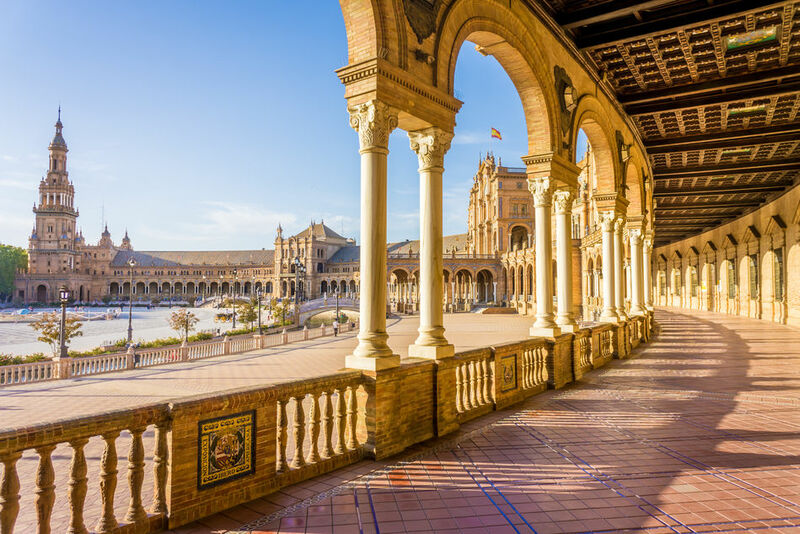 We soon arrived at the Plaza de Espana, a vast ornate plaza decorated with ornamental tiles representing a historic moment in each Spanish provence. I took lots of photos here as the architecture was amazing. After our visit here we headed to the Alcazar. Built in the mid 1300’s, the Alcazar was the palace of Spanish kings for nearly seven centuries. 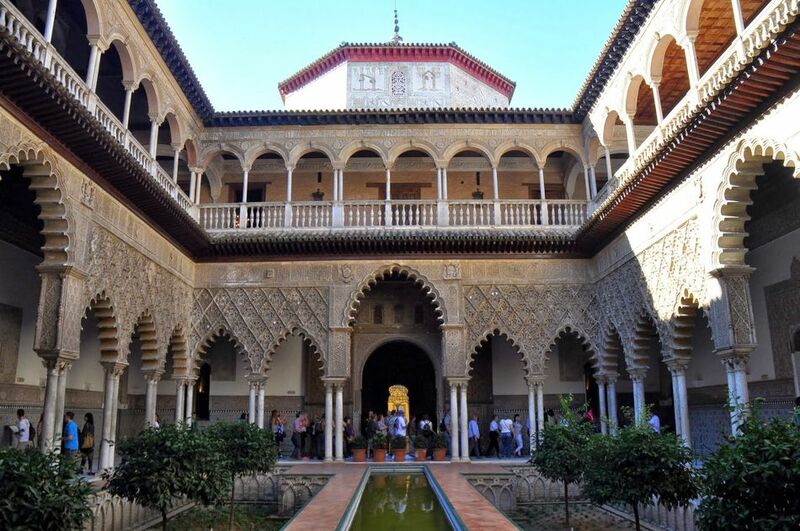 Its fanciful floors, ceilings and walls are intricate works of art, and the Patio de las Doncellas is noted for its friezes, tiles and stucco work. I really enjoyed out visits here and as we left we went via the Jewish Quarter, with its narrow streets and cobbles. We then proceeded to the Hospital de la Santa Caridad, a 17th-century hospital linked to the legend of Miguel Manara. The building houses a stunning baroque chapel containing works by the 17th-century painters Murillo and Valdes-Leal. The tour bus dropped us off back at the ship, and after a bite to eat we went back out exploring on foot as everything is so close to where the ship docked. That evening we dined in the main dining room with some of our new best friends for our final night of the cruise, then headed up to The Looking Glass for a farewell dance! Our favourite bartender was there, Krishnan, who magically makes our drinks appear without us having to ask him! This has been another great cruise with Azamara Club Cruises. I had travelled with them before a few years ago, however this was prior to them becoming more inclusive and before they launched their Azamazing Evenings. These recent changes have only enhanced an already excellent cruise line. The ships officers, staff and crew are what really makes this ship special. Hotel manager Richard seemed to be everywhere, from saying "cheerios" on the gangway for disembarking tours, to greeting you in the show lounge, he was always eager for feedback to see if he could make your cruise even better. The bar staff around the pool bar and grill were always happy and smiling, and crew and staff always greeted you with a good morning or afternoon whenever they saw you around the ship. The Azamara Quest has a lovely friendly atmosphere on board and it’s clear the crew are a happy crew. The food was excellent and we really enjoyed the casual buffets on this cruise - more than any other cruise we have been on. The "more inclusive" works very well and leads to a more social atmosphere on board. The Azamazing Evening was a real treat, however I do wish Azamara would provide more selection of tours - so afternoon departures would be good and evening excursions too - to really maximise the guest enjoyment of staying later in port. My only real gripe of the cruise was that the DJ seemed to vanish at midnight, even if there were plenty of guests dancing and enjoying themselves. He would often switch to slow music to clear the dance floor and then he would disappear - leaving a pre-made "mix tape" on auto. Only a small issue in an otherwise excellent trip.